You have a few seconds online to make a good impression before a user gives up and moves onto the competition. Your home page is a critical starting point for your potential online customer, so what are the top five things to consider in getting your home page right? Visitors may have reached your site from a number of different starting points – a url from printed collateral, a link from a social media profile, a referral from elsewhere – for all of them it is critical that you summarise who you are and what you can do for them as soon as they hit the page. Beat around the bush on this at all and you will have lost them. What’s in it for visitors? When summarising who you are, don’t go for the company history and location approach, rather focus on your target customer or user group and fit your message to what they will be wanting from you and your site. Offer clear signposting as to what you can do for them and why they should choose you. What should they do next? Make sure that you include clear and compelling calls to action for the different users you understand will visit your home page. Be consistent across your site in these calls to action, as some of your visits will come direct to pages within your site, and so visitors should be able to respond consistently to your calls to action across the site. How should they contact you? Be sure to make it very clear both how and why visitors should contact you and give them options as to how to do this – by phone, by email, on social networks and or using an on-site contact form. You want to make it as easy as possible for them so that you can convert more of your visitors into leads and into customers. Why should they contact you? A visitor will move onto the next stage if you are presenting yourself with credibility, professionalism, and can clearly demonstrate these on your website. By presenting proof of your abilities, customer testimonials, social proof of Twitter interactions or Facebook fans, demonstrations of a living and responsive website, then you are more likely to attract leads. A home page for parents looking for children’s dance classes. 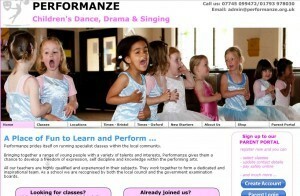 I have recently been working on a regional children’s dance centre website, at www.performanze.co.uk; it is a work in progress but on the whole we have considered these 5 things and have worked to get this home page right. What do you think are the must-have items to include in getting your home page right? I would love to hear from you in the comments below. And if you struggle to know where to start on this, I am always happy to hear from you and discuss how I can help. I need a website: where do I start?